On Tuesday April 17, the Wilson Central tennis teams clinched postseason berths for the Team District 9-Large Division tournament against Mt. Juliet. The Lady Wildcats wrapped up second place in the district regular season with a 5-2 win over Mt. Juliet, while the boys dropped a 5-2 outcome to the Golden Bears. Despite the loss, Wilson Central assured itself the fourth spot in the upcoming district tournament. Mt. 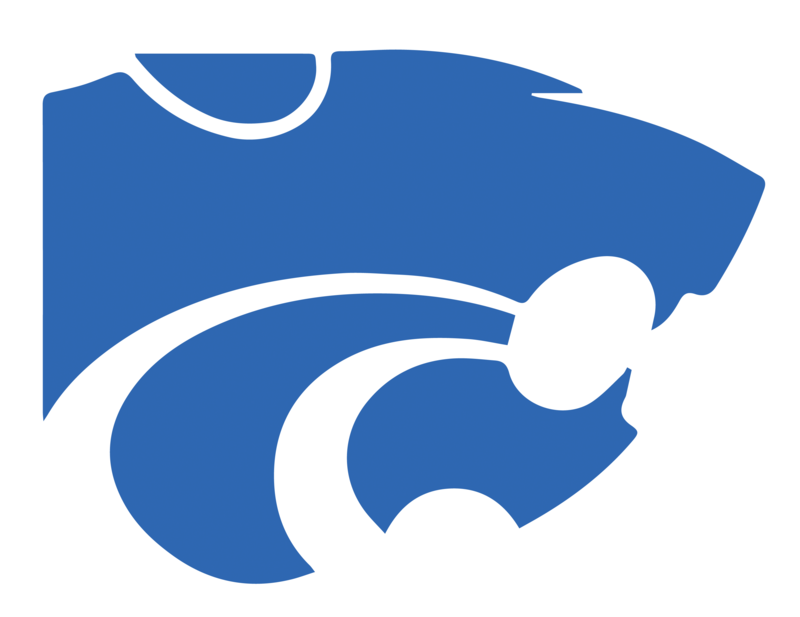 Juliet claimed a pair of wins last year over the Lady Wildcats including a 4-0 decision in the district tournament that ended Wilson Central’s season. The Golden Bears secured third place in the boys’ district tournament and will take on second seed Lebanon in the semifinals. The Wildcats will take on top seed Hendersonville in the other semifinals. Wilson Central will take on Mt. Juliet in a 2-3 matchup in the semifinals of the girls’ district tournament. Top seeded Hendersonville will take on either Lebanon or Macon County in the other semifinal. “It felt amazing knowing we were able to clinch the win tonight,” junior Sydney Miller, who earned the team’s fourth victory that got the win for Wilson Central, said. Wilson Central took an early 1-0 advantage with Miller and freshman Ashlynn Staggs taking an 8-3 win over Lydia Brandes and Cecilia Demoski at number two doubles. 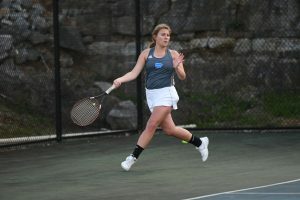 At one doubles, Wilson Central juniors Jacey Staggs and Savannah Westbrook struggled early with the steady play from Mt. Juliet’s Carly Earnhardt and Riquera Smith. Earnhardt and Smith raced out to a 7-2 lead, but Staggs and Westbrook began chipping away at the lead. 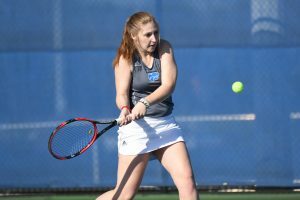 The Wilson Central duo took the next six games for an 8-7 advantage, and held a match point, but Earnhardt and Smith fought off the final two points to force the tiebreaker. However, in the tiebreaker it was all Staggs and Westbrook as they handily took the tiebreaker 7-3. 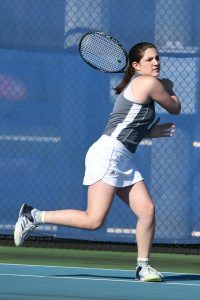 “There were definitely conversations between the two of us, with us trying to hype each other up a lot,” Staggs said after she and Westbrook fell behind early in doubles. Junior Abby Moser picked up the team’s third point with a 6-0, 6-4 win over Lydia Brandes at number four singles before Miller’s clinching 6-1, 6-1 win over Caroline Fannous at three singles. “Mt. Juliet has always been a big rival of ours, and today really showed all the hard work we have put in this season,” Miller said. Added Jacey Staggs, “It feels great getting the win. After having a productive offseason, our girls’ team has shown a lot of improvement. It’s safe to say I’m really proud of how far this program has come. Earnhardt claimed a 6-2, 6-4 win over Jacey Staggs at one singles, while Smith took a 6-3, 6-3 outcome over Westbrook at two singles. Ashlynn Staggs picked up the final Wilson Central point with an 8-1 win over Demoski at five singles. 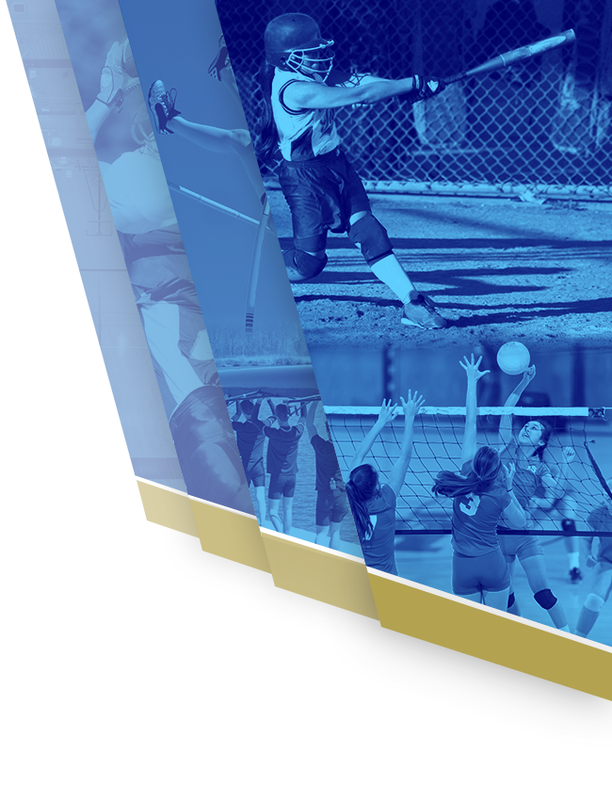 Kiersten Moss, Kaylee Wilson, Makena Lantz, and Kayleigh McGee picked up exhibition wins for Wilson Central. 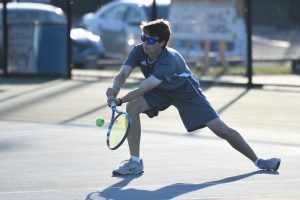 The Wildcats lost both doubles points against Mt. Juliet, and the Golden Bears ran away with the win. Mt. Juliet’s Evan Gamble and Ryan Ruesewald quickly dispatched senior Braden Hammer and freshman AJ Hughes by an 8-2 count. 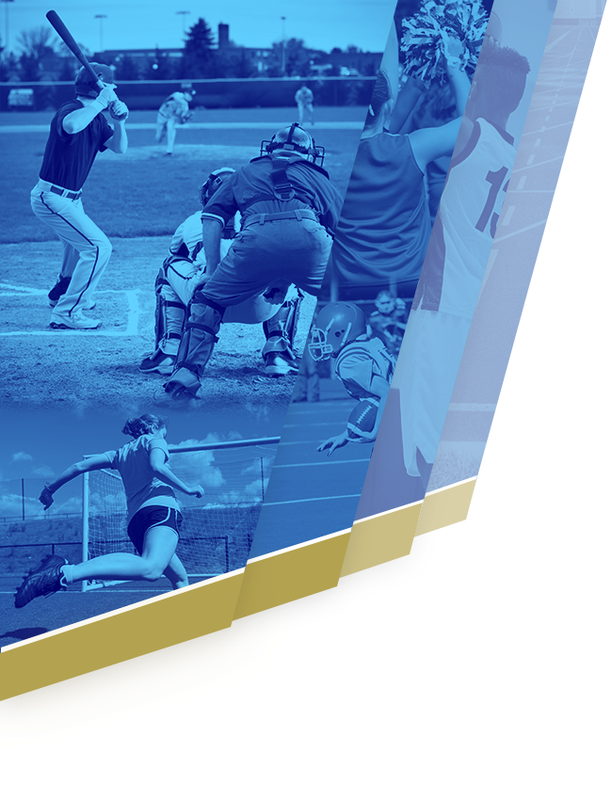 Wilson Central senior Andrew Denning and junior Michael Mercante jumped out to a 4-1 lead on Dillon Smith and Pierce Smith, but the Golden Bears ripped off four-straight games to claim a 5-4 lead. A back and forth set culminated in a tiebreaker where the Mt. Juliet duo played big points exceptionally well as they handed Denning and Mercante their first district doubles loss with a 9-8 (3) win. Mt. Juliet added to the lead with Josh Wiggins securing a 6-4, 6-2 win over Caleb Brown at five singles. 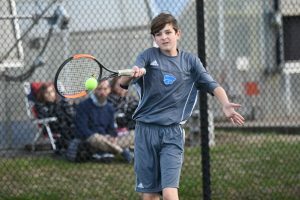 Mercante put Wilson Central on the board with his 6-1, 6-0 win over Dillon Smith at one singles, but Gamble’s 6-1, 6-3 win over Hammer assured the Golden Bears of the win. Denning defeated Pierce Smith by a 6-4, 6-1 count at number two singles, and Hughes lost a tight 7-6 (5), 1-6, 10-5 decision at four singles. Wilson Central travels to Murfreesboro to take on Siegel on Wednesday followed by a trip to Franklin to take on the Rebels. Wilson Central finishes the week with a visit to Gallatin on Friday.